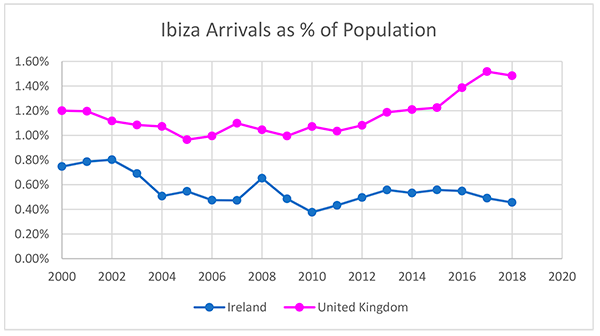 Irish in Ibiza, Ireland Tourism Statistics for Ibiza from 2000 to Present. We have previously apologised for the apparent Anglocentric compilation of our tourism statistics. We endeavor to reflect the interests of our British and Irish readers with a border-blind editorial policy. This may slip occasionally, especially during the World Cup when our Scottish, Welsh and Northern Irish readers would have equal cause to curse the typically arrogant English, but day to day I hope we get it right most of the time. The problem with statistics as far as Ireland goes is that they simply do not exist – at least that is what we thought until now. There are three main tourist statistic sources. Two of these, FITUR and EGATUR, are the official trade numbers presented by the Balearic Statistics Institute. They relate to occupancy, spend, demographic profile etc. Their breakdowns include nationality, but only those few with the biggest share, U.K., Spain, Germany etc are shown individually. Nothing for Ireland. The third of those you will commonly see quoted by us and the Spanish press are the AENA figures. AENA is the Spanish airport authority. Their numbers relate to air traffic arrivals and departures and use very similar breakdowns to FITUR and EGATUR. Again, nothing for Ireland. However, we discovered this week that the Balearic Statistics Institute also produce air traffic numbers. These are published a few weeks after the AENA numbers and so tend to be overlooked. But these do contain a far more detailed country-by-country breakdown – and so for the first time we are able to produce some statistics for Ibiza’s Irish tourism. 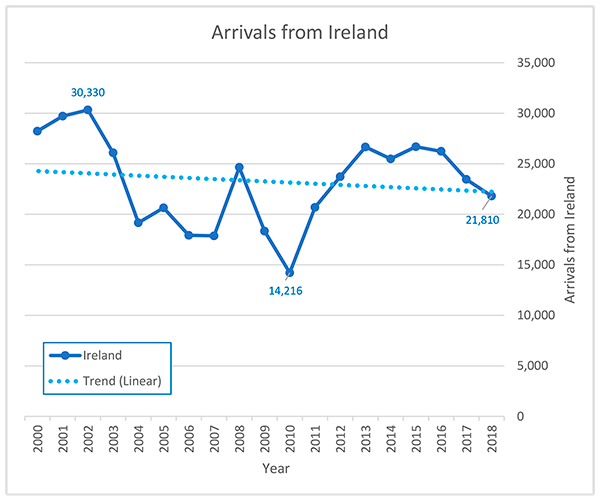 Without any direct winter flights throughout the timeline, we may think of the Irish statistics as more summer season only. Any small level of winter tourism would be unreported as coming via another country. This has allowed us to effectively complete the statistics for 2018 (using the 2017 November and December numbers for the Total Visitors and UK comparisons you will see below). The numbers are small in comparison to overall tourism. In 2018 Ireland’s 21,810 visitors equate to just 0.54% percent of Ibiza’s 4 million total. Back in 2002 Ireland’s 30,330 equated to 1.5% of Ibiza’s 2 million total. That may not seem a lot, but it does represent a change of three times less in ratio from then to now. At first glance the change at specific times could be thought to mirror Europe’s general economic trend during the crisis years. However, the first slumps are during the Celtic Tiger years of Irish boom. We like the idea of the Irish line reflecting the fortunes of Trance over the timeline – we know it’s nonsense, but it would make dull statistics a little more interesting. With such small numbers involved it is difficult to look at Ireland’s Ibiza tourism on the same graph as that of overall tourism. We have therefore superimposed it to data showing Ibiza’s total visitor numbers and the U.K. in the shaded areas but at a scale of millions (right) vs the Ireland graph in thousands (left). 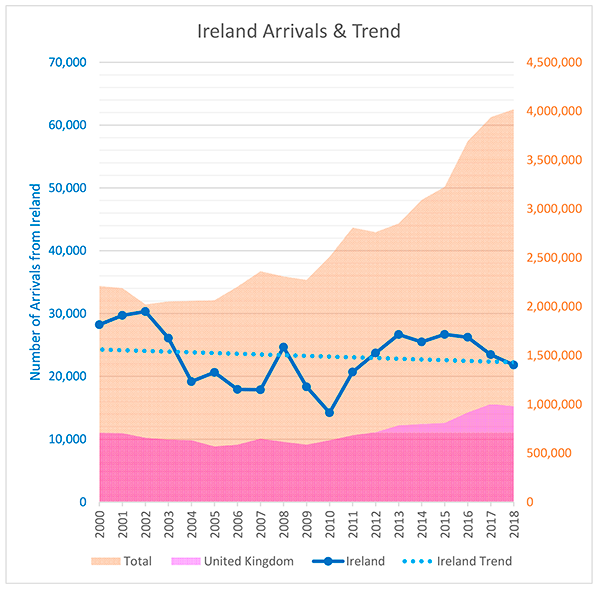 It is evident that the overall level of Irish tourism has reduced over the period, and is also on a short term decline. One thing no available statistics we know of show is the percentage take up of available seats – information the airlines are likely to want to keep confidential. However, Ryanair have recently announced a new route from Shannon to Ibiza which offers 22,000 seats (counting both arrivals and departures), so the potential to add 11,000 the Irish numbers. Despite having no expectation of Ireland’s tourism being anywhere near that of the U.K. for reasons of population size alone, the actual numbers provided by IBESTAT still came as a big surprise in being so small. Only 20,000? It feels like every single one must all be connected to us on Facebook. Or perhaps Celtic’s years of unchallenged success have resulted in their just being ‘louder/more shirt wearing’? But there simply is no way that I can accept the Irish comprise just 2% of the native English speakers in Ibiza – 2% being the ratio of Irish to British visitors. In all probability the answer is in the ratio of residents and workers being much higher than it is for tourists, but out of interest and to balance out the population issue we did compare the numbers as a percentage of population. Taking two population figures, we compared the stats 2000 to 2010 to the national population in 2010, and from 2011 to present we compared the stats to the population of 2017 . On that basis there seems little argument that the British have a much higher ratio of tourism in Ibiza than the Irish. But perhaps it is the trend that is more interesting. The British is rising, and continues to do so. The Irish is not. Ireland’s line is more akin to the German’s in losing their love affair with Ibiza. Either that or we need a new Armen Van Someone shaking things up :-) . All date used in graphs is shown below.